The 2013 Legacy and Outback models received the all-new 2013 TSP+ award. And Subaru is the only automaker on the planet to receive IIHS Top Safety Pick awards for every model it builds. If consumers are looking for a safe vehicle for the family, they need to look at the Subaru brand. It doesn’t matter which vehicle they choose, because every Subaru model has received IIHS Top Safety Pick awards. Subaru is the only automaker on the planet with the distinction of earning IIHS Top Safety Pick awards for every model it builds. That is a remarkable feat when it comes to building cars that are not only fun like the Subaru BRZ sports car, but safe as well. 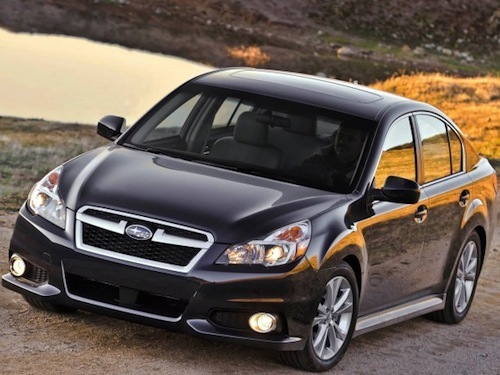 The entire Subaru lineup with a strong performance in crash testing includes the, 2013 Subaru Forester, Subaru Impreza, Subaru XV Crosstrek, Subaru Legacy, Subaru BRZ, Subaru Outback, and Subaru Tribeca. All vehicles have received the 2013 Insurance Institute for Highway Safety (IIHS) Top Safety Pick award (TSP). The IIHS has a more rigorous new TSP+ rating that requires good ratings for occupant protection in at least 4 of 5 IIHS evaluations, with no less than acceptable in any test. The 2013 Subaru Legacy and Subaru Outback are the first Subaru vehicles to have been tested for the Institute’s 2013 “TSP+” award and both vehicles passed with flying colors. The other vehicles in the Subaru lineup have yet to be tested. Fuji Heavy Industries Ltd., who is the parent company for Subaru, is committed to building safe vehicles. "The strong ratings of our products in IIHS testing supports Subaru’s belief in safety" said Thomas J. Doll, executive vice president and COO, Subaru of America, Inc. "Having 100% of our models listed as IIHS Top Safety Picks and now the Legacy and Outback models tested to TSP+ status demonstrates that." The Insurance Institute for Highway Safety recognizes vehicles in testing that do the best job of protecting people in moderate overlap front, side, rear, and rollover crashes based on 'good' ratings in each category. The IIHS ranks in terms of Good, Acceptable, Marginal and Poor, with 'good' as the top rank possible in Institute tests. Winners also must have electronic stability control. This is not a new development for Subaru, as they have received the top safety picks for every model it builds for four consecutive years. “Subaru is the only automotive manufacturer with the distinction of earning IIHS TOP SAFETY PICK awards for every model it builds," said Institute president Adrian Lund. "Subaru deserves praise for making safety a top priority." Subaru vehicles are the safest on the planet but they are also green. All Subaru’s are manufactured in zero-landfill production plants and Subaru of Indiana Automotive Inc. is the only U.S. automobile production plant to be designated a backyard wildlife habitat by the National Wildlife Federation. All Subaru models are safe for families, and the 2013 Subaru Legacy and 2013 Outback models have been given the top TSP+ status. Is it any surprise that Subaru has reported the Legacy, Outback and Impreza models experienced the best November sales month in history, and best overall U.S. November sales in company history?